Thank you for visiting Monarchball.com. My name is Rance Meier, and I am based in Oklahoma City, Oklahoma. 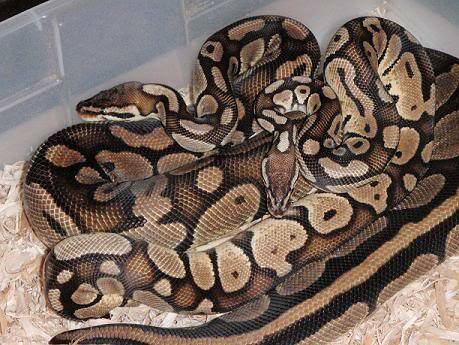 I specialize in captive propagation of ball pythons, and have been successfully doing so for over 18 years. In 1999 I acquired a pair of very ugly pastels. Over the course of ten years, the snakes simply did not thrive. They were poor eaters, and it seemed like they would never grow. Around 2008 the pair started eating like crazy, and would breed every time I put them together. After a decade of testing my patience, the female was finally gravid. Once she laid, I was disappointed because there were only two good eggs in the clutch. After everything I had been through with these pastels, I shouldn’t have been surprised! When the eggs hatched, I expected to find normals, pastels, or super pastels. But I did not! One baby looked like a Genetic Stripe, but very light in color, while the other had a more normal pattern. Their colors were a yellow orange, with a deep purple color, and both lacked black pigment. I was excited and confused at what I was seeing. I now know that the parents are actually double heterozygous, het for the new gene Monarch, and also het for Genetic Stripe, both being simple recessive. The two babies ended up being a Monarch Pastel, and a Monarch Pastel Genetic Stripe. A year and a half later, I paired the pastels again, and got a 7 egg clutch. The results were: 2 Super Pastels, 1 Genetic Stripe, 1 Pastel Genetic Stripe, 1 Super Pastel Genetic Stripe, 1 Monarch, and 1 Monarch Genetic Stripe. This clutch gave me the snake expressing the single Monarch gene. I’m very excited about the Monarch Project, and what the future holds for it. This project is still very much in its infancy, and has tremendous room to grow. There are some great investors, both domestic and abroad, and I can’t wait to see what direction they take with this gene in their collections. I pride myself on quality animals, and strive for exceptional customer service and honesty. Maintaining my small collection is always enjoyable, and my attention to detail and exceptional husbandry skills mean you can have confidence in any animal you acquire from me. Take some time to explore the site, and see the sights! I am always happy to help, and available to answer any questions you may have!